Welcome To The Future, Here's Your Jetpack | OhGizmo! I’ll be honest: in the realm of sci-fi tech, I’d always thought of the personal jet pack as showing up after the flying car, neither of which would be making a realistic appearance anytime soon. Turns out I’m dead wrong: the personal jet pack that you can buy is set to be released December 11 of this year. 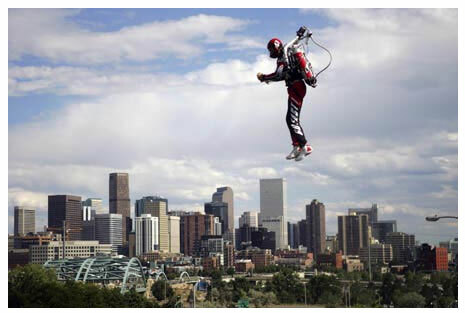 It may or may not surprise you to hear that jet packs (of a sort) are old news. Bell Aerosystems had a personal rocket belt back in the 1960s, and a few different companies are currently offering the same hydrogen peroxide powered sort of thing, including Tecaeromex, from whom you can buy a working version for $250,000. The downside of rocket belts is that they only get a maximum of 30 seconds flight time, and the fuel is expensive and dangerous. Bell Aerospace started working on an actual jet pack in the late 60s, which had a hypothetical flying time of 25 minutes and a top speed of about 80 mph, but dropped the project due to it’s complexity. This looks as if it was shot in Providence. I wonder if it was tested by the goofballs at Brown University. That guy was on an episode of American Chopper. He was a part of the “big reveal”. Talk to Nelson Tyler. No one knows more about how hard this really is to do. Too bad I can’t afford one. Happy to see them make a comeback! Couple one of these with a power-assist suit and you've got the makings for an Iron Man suit! See this; TOVL – take off vertical landing, (Power plant & Propulsion) New system. That is crazy!! I want a jetpack!!! Anyone want to lend me 200,000 dollars? lol Check out my site sometime.